I had done some research on the Internet looking for a fruity scent that would actually smell like fruit not some chemical concoction that fails to smell even close to the fruit notes and then just fades away after 20 minutes. 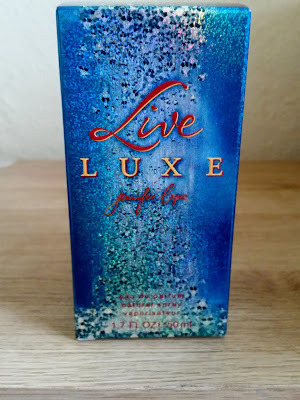 This is what lead me to the Live Luxe by Jennifer Lopez. With my birthday coming up, i received this as an early birthday present. The box is a gorgeous aqua blue which sparkles slightly in the light. Which i find a nice touch and makes it stand out from just the regular packaging you receive with other scents. 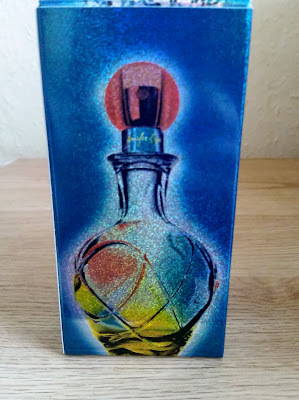 On the back is a picture of the bottle that also sparkles in the light. I adore the bottle! 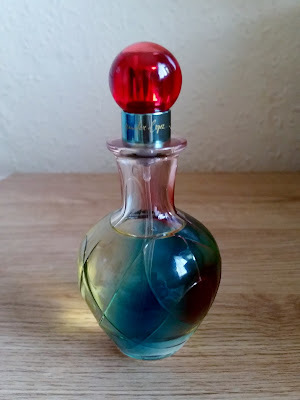 You only have to read my other reviews to get an idea of how many scent bottles i own. 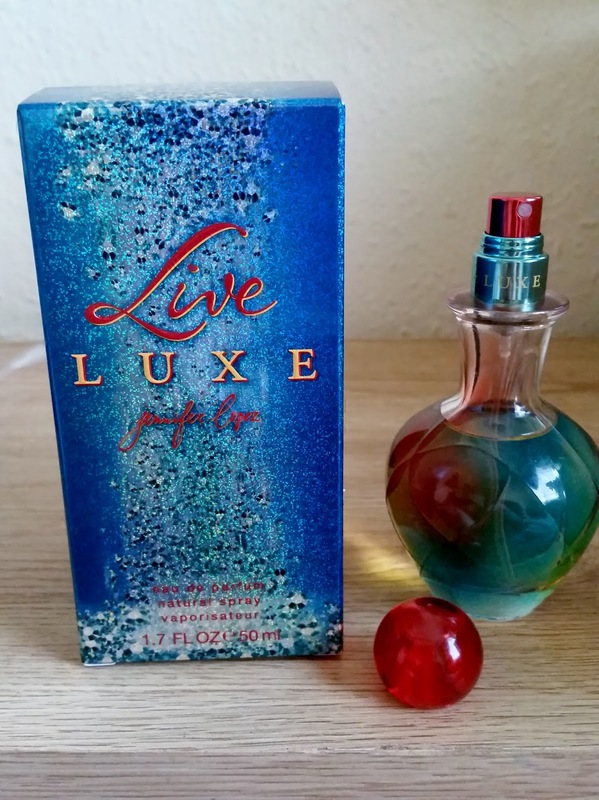 The Live Luxe bottle is glass and felt quite heavy for the 50ml. Though it does feel sturdy and fits comfortably in your hand. 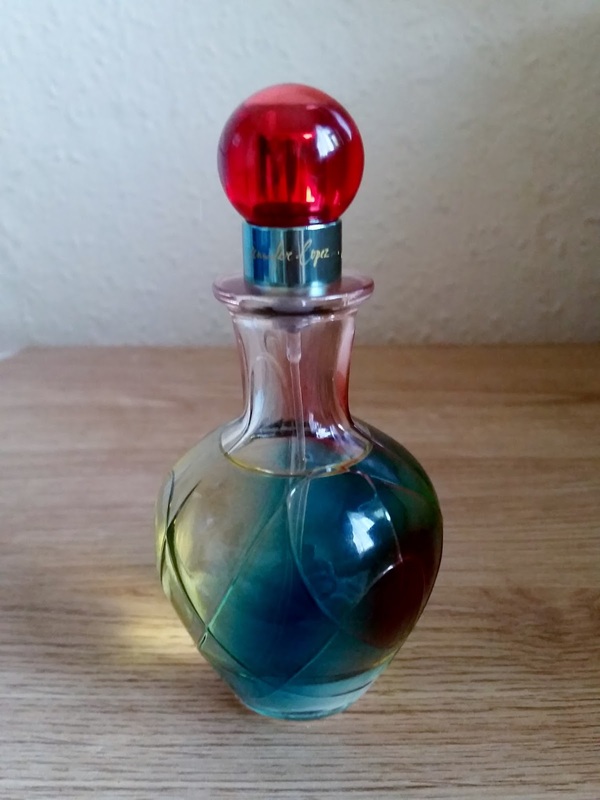 It features a glass pattern all around the bottle and which ever direction you turn the bottle it changes colour to gold, red, and aqua blue. I really like this idea as it adds that touch of glamour to the bottle and also separates itself from the normal standard clear ones u can get. Just below the head sprayer it features the words Live Luxe Jennifer Lopez. The head sprayer is red and also the head stopper is a rich ruby red which works well with the other colours that are produced from the bottle. The sprayer head works really well and produces a good amount of the parfum. 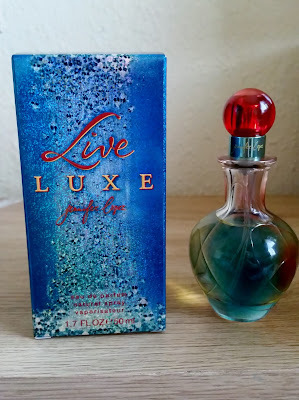 Live Luxe is a fragrance by Jennifer Lopez's passion for dance and anything luxurious. The composition is very dynamic and temperamental. It opens with Juicy Pear and Peach. Electric Circus, Sun Sweetened Honeysuckle. The heart is a bouquet made of muguet petals and exotic amethyst freesia. The base is composed of diamond musk and soft musk. Vanilla and Sandalwood. Fruity. Aquatic. Floral. Sweet. Ozonic. Fresh. On first spray this is big and loud! Word of warning do not over spray! U don't need to with this. The peach and the sweetness opens this scent with a hint of pear. It isn't overly sweet like your smelling like a candy store, it is well balanced like a sweet fresh fruit cocktail. The maguet petals make an appearance which are Lilly of the valley and then comes the musk. The big juiciness of this scent last's about an hour or more and then this changes into a light classy musk with fruit undertones. Live Luxe lasts all day.... yes its that good! If you like your fruity-floral scents then you will love this! which is why its called Live Luxe. So if your looking for a gorgeous luxury bottle and a statement, STAND OUT from the crowd luxury scent. Live Luxe by Jennifer Lopez.